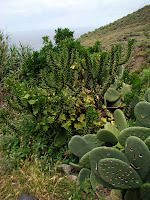 After the delicious Dutch breakfast, we began our excursion to the northern side of the island. Since it wasn't really amazing weather anywhere, we had tossed the beach option and decided to see a bit more of the interior of the island maybe if the weather cleared up, take a nice nature walk. 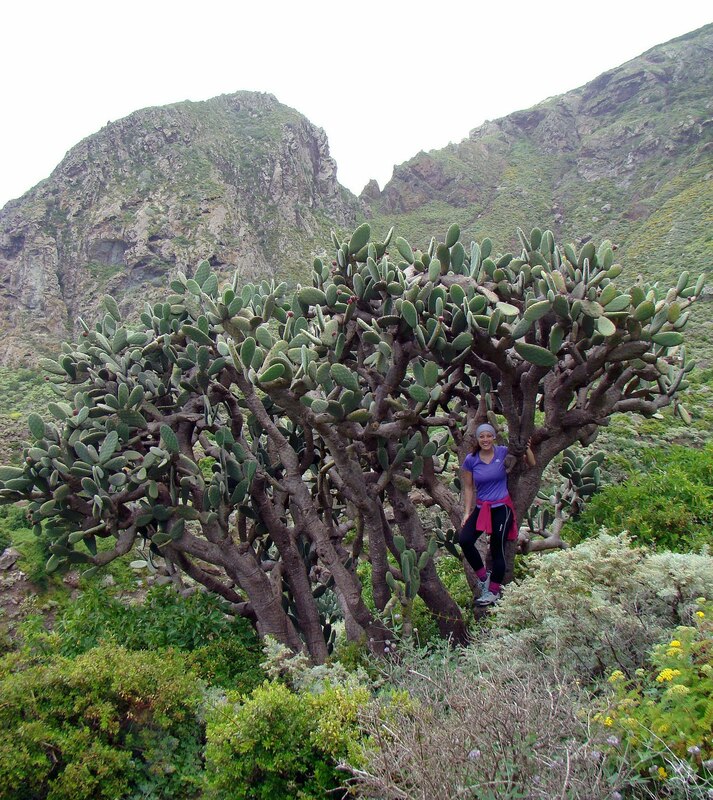 Tenerife is known for it's beaches, but there is also a wealth of forest footpaths, coastal walks and desert paths to discover more. We set off in the car towards a small village called Taganaga, nestled in the Anaga mountains on the northeastern tip of the island. Founded in 1501, it's sugar cultivation boosted population and although it is said to be in one of the most beautiful parts of the island, it has somehow escaped tours trapsing through. The windy and steep hill to the bottom of the valley brought us to the town entrance and our small rental car felt like it might not be able to squeeze down the narrow cobblestone streets. Upon entering, we saw a bunch of chirigoteros, and parked the car to get out. 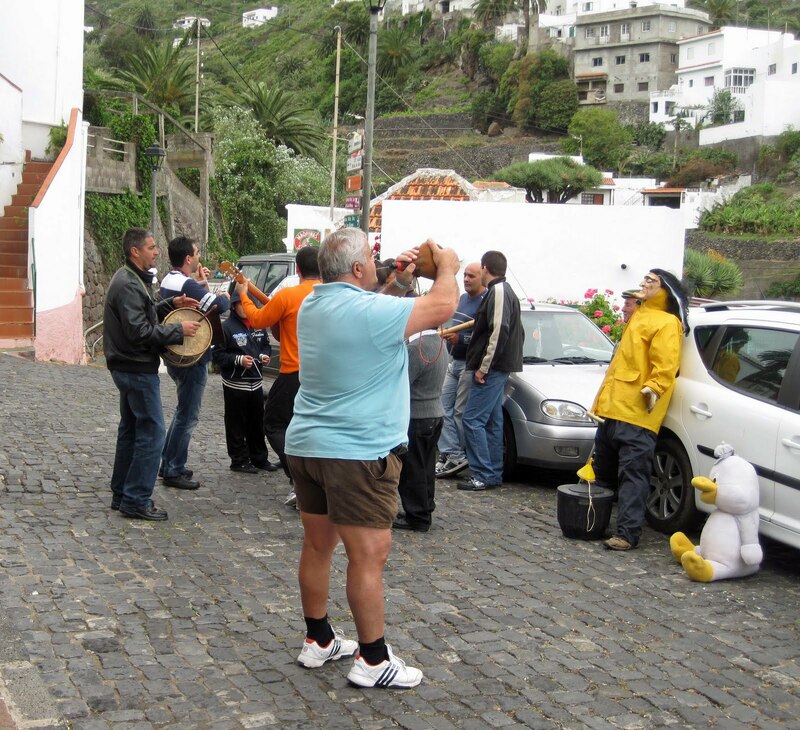 A chirigota is a group of locals who just come together spontaneously and start playing music for the town. Being Easter Sunday, the group had gathered in front of the main church, which was funded in 1515. Although it is a small village, it seemed like everyone was there! Not only singing or clapping along, but also drinking and dancing. A very typical way to drink in Spain is from a leather bag, which you fill with wine (or anything I suppose) and squirt it into your mouth. We were the only tourists and smiled along with the locals, which I guess they appreciated, because one friendly local offered us a squirt of wine! 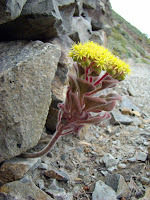 flower that had what looked and felt like furry leaves; or the cactus that we saw in many stages of development that started green, then the backsides of its leaves changed to a magenta-ish red, then out popped a pink flower! Crazy nature! The walk wasn't just about vegetation though, we also stumbled upon two little housing areas, which probably used to be a Guanche community. As you remember, the Guanches were the original inhabitants on this island before Spanish conquisition in the early 1400s. With clothes made from goat skins and beaded baked-Earth jewelery, the Guanches are thought to have come from Africa when the Sahara dried up and became a desert (the languages have similar numeric systems). With houses made of stone, that had no electricity and were atleast 1 hour walking to the main road, I was incredibly impressed that this people maintained this lifestyle. 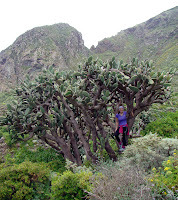 While not Guanches ourselves, we did manage to eat lunch atop a huge rock while looking out over the sea of cacti and crashing waves, climb a cactus tree, and relieve ourselves next to beautiful plants - all very possible Guanche-like activities. But, when push came to shove, we are just normal people and when we got really hungry and almost out of water, we headed back to the car, ready to try a typical Canarian dish. At the restaurant at the base of the trail, the windows were all open and the smells wofting from the run-down kitchen were delicious. 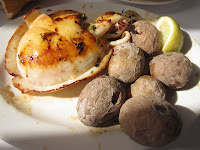 All I had heard about and read about were these papas arrugadas - which is the Spanish (Canary Island Spanish at that) way of saying wrinkled potatoes, so that's what we ordered. Now, I was thinking crinkle-cut fries, but these are actually small potatoes boiled until the water disappears so that the skin turns wrinkly and then heavily salted. Served with some sauces called mojo, they were tasty, but to me, it was kind of like eating a extremely overcooked baked potato. To accompany our potatoes, we ordered some cuttle fish, which is similar to squid but a bit tougher, but filled the belly up just the same. That evening we made our way to Puerto de la Cruz, on the northwestern side of the island, to our hotel apartment. We always enjoy renting an apartment style hotel room when we go somewhere for a longer time, so we don't feel so much like we are living out of a suitcase and we can manage a refridgerated breakfast. This place, Los Dragos, gave us a plain but big apartment, and we happily settled in and as soon as the lights went out we were fast asleep. The next morning it was quite cloudy, so jumped in the car and headed to the south of the island, where sunshine is almost always guaranteed. 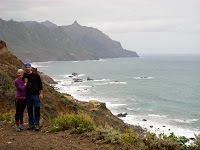 The tourist office guy had told us about a little beach called Playa de la Tejita, so we decided to go there. Why you ask? Because, it is a GASP nudist beach. Neither of us had ever been to a nudist beach before and we figured that heck, we are on vacation, let's go crazy, so we went! 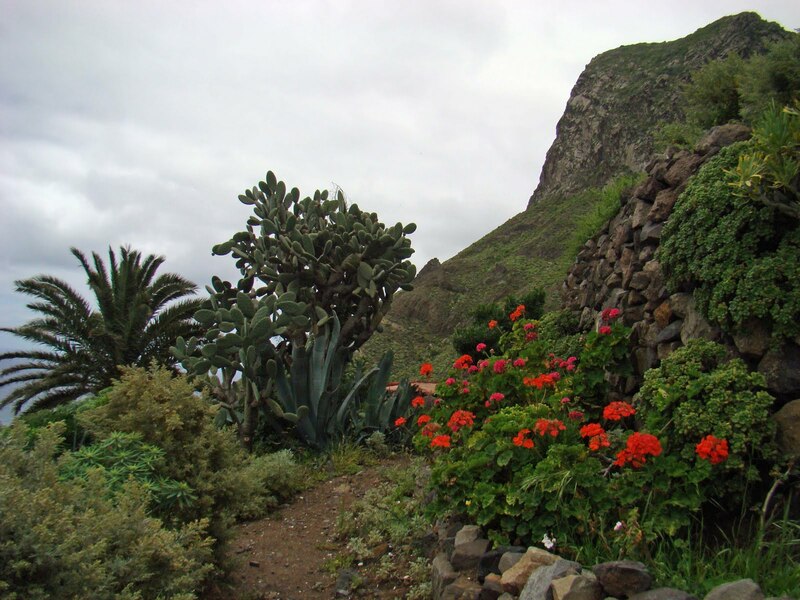 Nestled between a little rock formation and a large hill that juts out into the sea called La Montaña Rojo (The Red Mountain), the wind was much calmer and it was kind of secluded. We arrived and stripped down to our birthday suits and put on some sunscreen, then some more and then a little more, just for good measure. While there were a good amount of people, I never once felt embarrased or self-concious. Everyone kept to themselves and it didn't feel dirty or strange at all. Just everyone, accepting thier bodies, not criticizing others and just enjoying the mid-equator sun! Add that to the list of crazy things I didn't think I'd ever do! And sorry to disappoint...but no photos hahaha. With the good majority of the day on the beach, we made it back to Puerto de la Cruz just as the clouds were clearing and headed down to the main part of town for dinner. We set our eyes set on a big pasta dinner to fill up on carbs, because it was the night before our big hike on Mount Teide (Spain's highest peak). With our eyes set on the top, we wanted to make sure we had a lot of energy for our 5am wake-up and partial darkness-hike to be on the mountain for the sunrise. And boy was it worth it. I will happily tell you about the sun's first morning rays in the next blog!